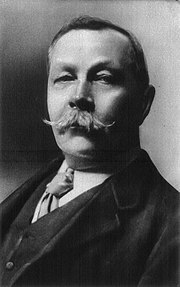 Sir Arthur Ignatius Conan Doyle (22 Mey 1859, in Edinburgh – 7 Julie 1930, in Crowborough, East Sussex, Ingland) wis the Breetish owthor maist kent for his stories aboot the detective Sherlock Holmes that's aft considert a muckle innovation in the field o crime feection. He wis a thrang writer that's ither warks includes science feection stories, historical novelles, plays an romances, poetry, an nane-feection. Wikimedia Commons haes media relatit tae Arthur Conan Doyle. This page wis last eeditit on 13 Mairch 2016, at 01:28.